Trailhead is on Craney Hill Road in Henniker, NH. To get there, take Flanders Road from the southwest side of Rt. 114, 2.6 miles southeast of Rt. 202. Drive 0.9 miles down Flanders Road, passing by Pats Peak. Turn left on the steep Craney Hill Road and go 1.1 miles to the first flat area in the road. You will see two houses on the right and another on the right immediately before you reach the trailhead. If you arrive on the right day, there should be a sign pointing the way to the tower up the woods road on the left. Craney Hill is an undistinguished hill in the town of Henniker. Pats Peak Ski Area, far southern New Hampshire's finest ski area, is located on its northern slopes. Its summit bears a former fire tower, which is maintained by a local club for fall foliage viewing. They only open the tower to the public for four days a year, which is quite an inconvenience for hikers who would want to see the excellent view from the tower whenever they want. If you live nearby or are in the area at the right time, take the opportunity to see the fine fall foliage on the second and third weekends in October. Visit the Henniker town website for the open dates each year. It does not have a consistent page for the tower, so you will have to enter "Craney Hill" in the search field to see if the dates are posted yet. When you are there at the right time, the wide dirt road will take you up to the tower in 0.4 miles. Follow it along a clearing, then around a 180-degree turn past some houses. The road then climbs steadily past the top of the clearing and up to the grassy summit. The fire tower offers views in all directions over the trees. Many distinctive southern NH peaks are visible, including Crotched Mountain, Mt. 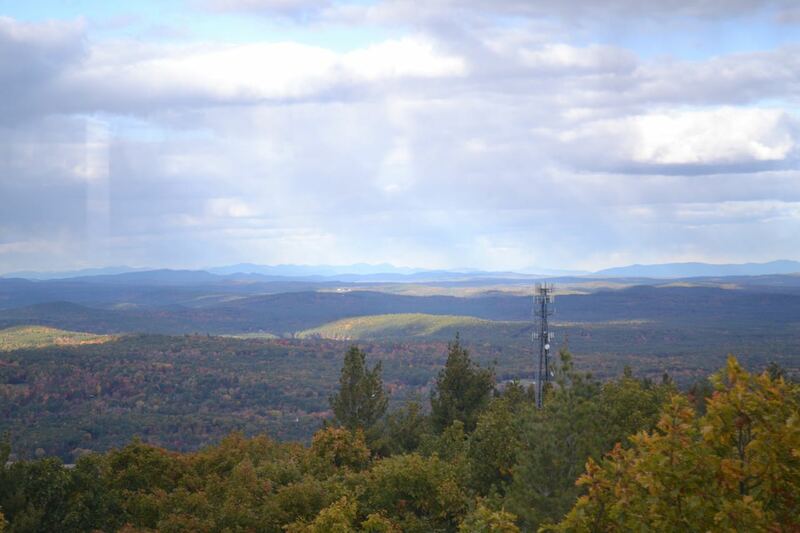 Monadnock, and the Wapack Range. The nearby Mink Hills of Bradford are the largest nearby feature; much of the surrounding area is flat. There is a great down-look on Craney Pond, at the base of some of the Pats Peak ski trails. Perhaps the best scene in the view is the profile of the White Mountains in the distance.